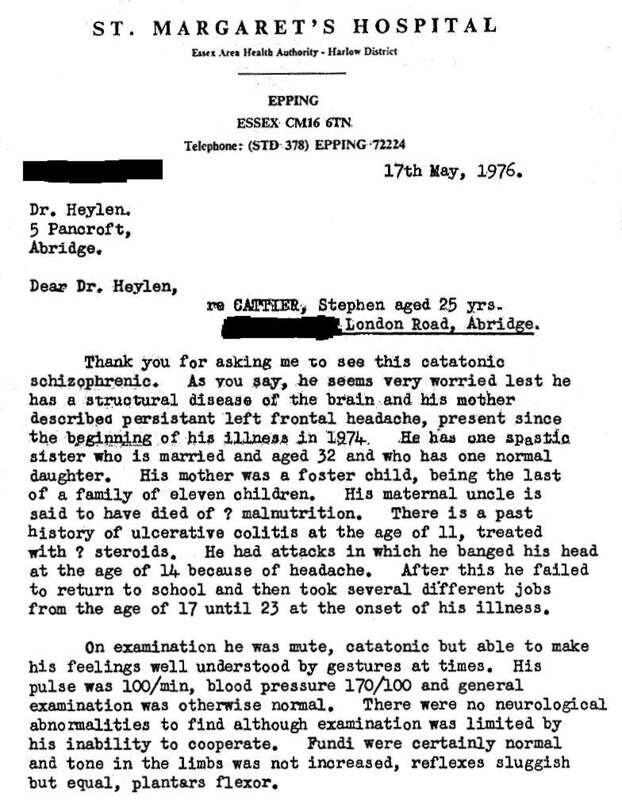 Consultant neurologist, Dr. M. A . Barrie's report on Stephen Cattier, 17 May 1976. 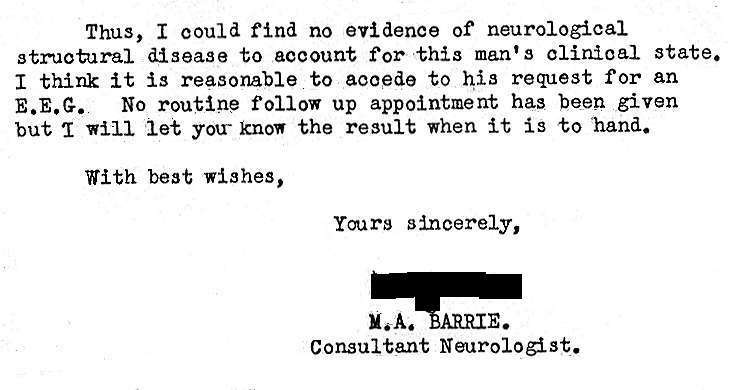 Private consultation report the author had with Dr. M. A. Barrie, consultant neurologist, May 1976. My GP, Dr. Heylen, refused to refer me to a neurologist on the NHS which meant I had to go private. I had finally woken up from the mental illness that Modecate depot injections had given me for several months after discontinuing it in October 1975. It had made me forget to prove the illness although I used to tell Dr. Heylen what it was. It also made me for about six weeks stupidly attend a rehabilitation centre in Harlow doing easy work and getting the bus every day. I had to rest after an hour and ten minutes working because the fuel would run out in my head and the arms would start to cease up until a rest made me able to carry on. The same thing happened in forgetting to prove the illness from September 1976 but for longer then when I stopped Modecate depot then after having it forced upon me for three months on a section under the Mental Health Act for refusing it. Fortunately, it improved the brain injury so that I got walking after leaving it off. Then again perhaps it was instead the Kemadrin responsible or a combination of the two. I saw Barrie in the afternoon but I am sure I suffered a relapse in the morning, or the day before, when I blew my trombone for about twenty minutes. That activity used up the little remaining fuel in the mind to another damaging level. Consequently, I was unable to talk but I could walk and did but I could not communicate apart from a shrug of the shoulders. Barrie says I made gestures but I only can remember the shoulder moving. The left frontal headache was mostly not a pain but a squeezing from me talking and using up the fuel in the speech mechanism of the mind. The speech area of the brain is located there. I do not know if the tightening sensation which I still experience is in the brain or in the scalp. The head banging at age fourteen was severe periodical headaches which were a side-effect of Prednisone or Prednisolone that I took when diagnosed with ulcerative colitis. I did attend school afterwards and took CSE exams. The bowel trouble disappeared in 1966 and I left school normally in 1967 aged sixteen. I had nine jobs, not several. I had the EEG straight after the consultation. The operators were impressed by the readings and asked me if I was depressed which I was not but I was not able to reply. My head felt tight from the ongoing relapse which I think must have altered the readings to make it just appear I was depressed. The next day the relapse progressed so that was I was unable to walk for two to three weeks. I was admitted to Claybury Hospital for three weeks. When the ambulance came to take me away I clung to the chair as I did not want to go.